« UK’S Top 50 design studios revealed in Computer Arts using Celloglas’ Glow in the dark varnish. Issue #271 of Computer Arts magazine saw not one, but two cover options finished at Celloglas Leicester. This edition focused on the Brand Impact Awards of 2017, an event that celebrates the best branding from around the world. It’s run by Computer Arts and Creative Bloq, so naturally the issue reflected this event that brings together some of the best creative minds in the industry. The issue was designed as a split run cover, where three quarters of the run used a slate grey background, and a quarter of the run was on a subtle cream. The background colours were different, however, all the other colours used in the design remained the same. The way these colours contrasted against the different backgrounds created two unique looks. After printing, the sheets were sent to Celloglas for finishing. Firstly, an overall soft touch varnish was applied to the sheets on our Heidelberg machine. This finish offers a tactile, velvety feel. It also has a matt look, which contrasted against the foils that were applied afterwards. As the placement of foils was the same on each cover, both cover colour options could be run side by side. The position of the foils was key, so before running, the sheets went through a make ready process to ensure everything was aligned correctly. 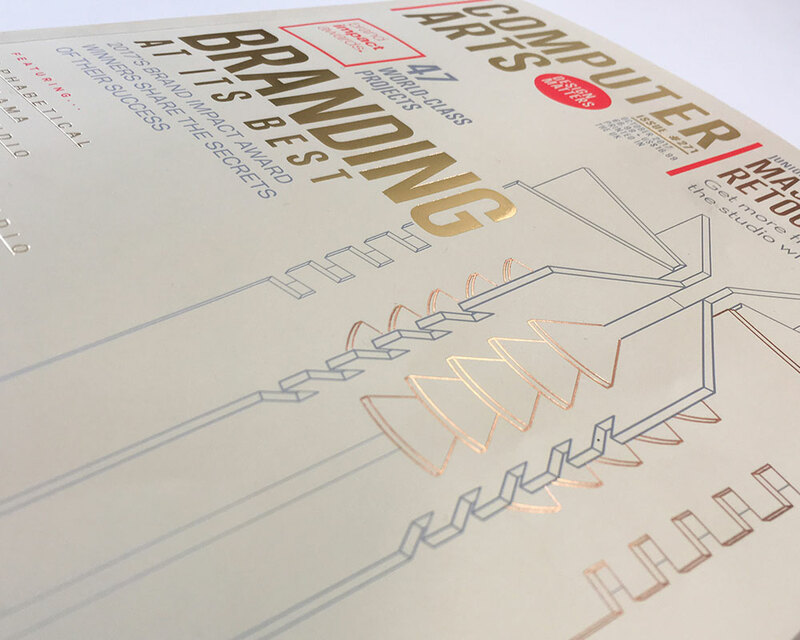 Matt gold and shiny copper foils were used to decorate the cover, chosen to represent the colours of the metallic Brand Impact Awards trophies. The foils were applied in two passes, one for each colour, on our SBL foiling line. During the initial printing process, a metallic silver Pantone was printed onto the sheet which completed the three award ranking colours, and a bright red Pantone was used for the BIA logo. Take a closer look at the making of these covers.